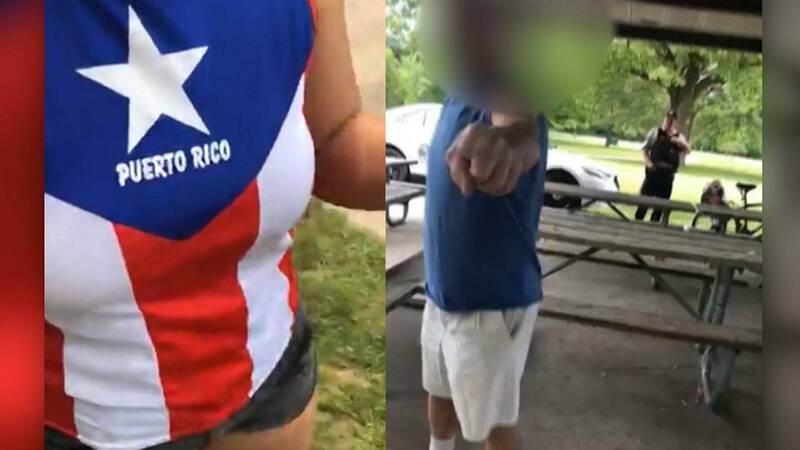 (CNN) - An Illinois man accused of harassing a woman for wearing a Puerto Rican flag shirt at a Chicago-area park was charged Thursday with state hate crimes, authorities said. Prosecutors filed the two Class 3 felony hate crime charges against Timothy G. Trybus, Cook County state's attorney's office spokeswoman Tandra Simonton said. Trybus' attorney, David B. Goldman, said by telephone that his client had six teeth removed the day before the incident and was under the influence of pain medication and the effects of alcohol at the park. A parks officer has resigned after being criticized for not intervening during last month's 14 incident. which was caught on video at a northwestern Chicago park. Irizarry said she was celebrating her 24th birthday at Caldwell Woods park when the man approached her and asked her why she was wearing the sleeveless Puerto Rico flag shirt. It also had "Puerto Rico" written below the neckline. An attorney for the Illinois Fraternal Order of Police Labor Council, which is representing Connor, said that the video "does not look good" but cautioned that it may not tell the whole story. "We don't know what was happening outside the video; we don't know what was going on inside his (Connor's) head at the time," the attorney, Tamara Cummings, said Thursday. "He was looking forward to an opportunity to explain what was happening. However, given the media attention and pressure, he decided to resign. "Given his decision to resign, he won't be offering any additional comment on what might have happened during this situation," she said. "He's very distraught and not happy about having to leave employment much sooner than he intended, but because of the strong reaction from the public and political figures, he thought it would be unrealistic to stay as an officer." The preserve district police chief, Kelvin Pope, said he didn't know why Connor apparently didn't step in initially. Pope said that Connor feels "he wasn't given a fair shake" and that "he was very remorseful." But the officer resigned before investigators could ask him what happened during a disciplinary hearing, Pope said at a news conference Thursday. "(Connor's) personnel file will reflect that this officer did not resign in good standing, with a note indicating that he left the district with discipline pending," said Arnold Randall, the park agency's general superintendent. Cook County Commissioner Jess "Chuy" Garca had called for hate crimes charges against Trybus. "A charge for simple assault or disorderly conduct is not sufficient," Garca said. "We cannot allow that ugly rhetoric to be the norm in Cook County." "It's up to each and every one of us to present a better model to demonstrate with our own actions how to treat each other with more respect," he told reporters Thursday. "We might start with the fine example presented by Mia Irizarry and her family, who handled this ugly incident with great composure, never stooping to the level of the man who attacked her." In the footage, a man can be seen approaching Irizarry saying: "You should not be wearing that in the United States of America." He gets closer to her and asks "Are you a citizen? Are you a United States citizen?" Irizarry says Puerto Rico is part of the United States and the man approaches her multiple times. She asks a park police officer to help, saying, "I am renting this area and he's harassing me about the shirt that I'm wearing." Then she says: "Officer, I'm renting, I paid for a permit for this area. I do not feel comfortable with him here, is there anything you can do?" The officer can then be seen talking to the man who gesticulates back and tells him to "shut the f*** up." More police arrive and Irizarry says she still doesn't feel safe. The man resumes his abuse, saying: "You're not American, if you were American you wouldn't wear that. You know that right?" A female officer asks to see his ID and can be heard telling him that he's intoxicated, to which he replies, "Well that's your judgment." She explains that Irizarry has a permit and she warns him he could be arrested "for not being compliant." "You don't come here harassing people," the officer continues. "People have just as much right to be here as you and when you're drunk, you don't belong here." Eventually the first officer on the scene takes notes of Irizarry's account and says he was at the scene due to the separate incident, noting that she was not being attacked though acknowledging she felt threatened. Correction: An earlier version of this story incorrectly spelled the surname of the police officer who resigned. His name is Patrick Connor.